Plant Stand and Pirates Chest! 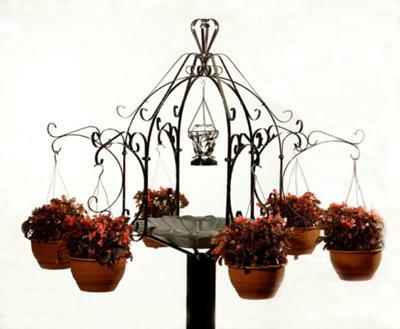 The two projects I downloaded, the one is a plant stand with a birdbath in the center. The other one is a pirates chest. 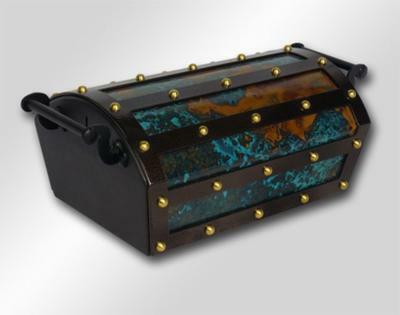 The chest is made of brass, copper patina and iron. I make them so they can hold two bottles of wine in a rack which is removable so a person can put other special items into the chest. I also put a money slot so it may be used as a bank. I am a metal artist that lives in northern Wisconsin, and have been working with mostly iron for over 30 years. I really enjoy working with iron as a medium it works very well in the projects I do. I also work in somewhat of a lesser degree with copper, aluminum, brass and stainless steel. The most important thing in making metal art is having ideas and it's even better to have good ideas. The other trait is the ability to eye ball things without using a tape measure. If you would like to see some of my other designs you can look at them on my web site cooliron.com. If anybody would like some help with there project or looking for ideas I would gladly give you some input. Comments for Plant Stand and Pirates Chest! Gary I love the chest and the stand they are beautiful. I would like very much to know how you built the chest? Please contact me at lanybishop@gmail.com look forward to hearing from you. Your work is very impressive. The workmanship is clearly top notch. Thanks for sharing. Do you have any other projects you are working on?